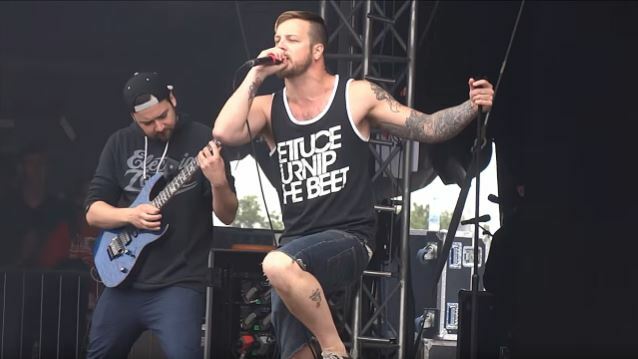 Known for being progressive not only in their sound but in their music business acumen, PROTEST THE HERO have announced a unique distribution model for their upcoming six-track EP. Structured as a subscription service for fans, Pacific Myth officially launched last night and will deliver one track on the 15th day of each month over a six-month period of recording, as well as access to a gamut of original content not available anywhere else. Here is a message from the band regarding Pacific Myth: "If you know a bit about our band, you probably know that we like to stir the pot. We value that our fans have come to expect the unexpected from us. "Here's the thing: we have done the full-length album and ensuing record cycle four times. Most record cycles are at least two years. That's two years of promoting 40-or-so minutes of music…music that may have been written two years before that! We have never been able to release what we want to release NOW. So that's exactly what this is. These are songs we love now, songs we are proud of now, and songs which are inherently more candid than our other material. "The original dream was to create a subscription-like platform for our music where 'subscribers' could enjoy the scheduled arrival of a new PROTEST THE HERO tune every month, on the same day, at the same time. While we battled with the logistics of launching such a beast, Bandcamp came along and pretty much nailed it. So here we are! "We believe this to be a sustainable model for what we do and a wonderful and honest way of getting more music made for you all. By subscribing to 'Pacific Myth', you will get a tune a month starting on October 15 as well as access to all the content we've collected along the way. It will include pictures, journals, lyrics, musical transcriptions, samples of music to come and some rookie-edited videos to keep you either entertained or appalled while you wait for the next month's material. "Thanks for reading, listening and watching our careers thus far. Know that absolutely none of these projects would be possible without you. We dig ourselves further in your debt with each signup!" The service will be structured in two tiers for fans to choose from. Tier 1 subscribers will access unlimited streaming and various audio formats of the monthly track, an exclusive instrumental mix, hi-res artwork, lyrics, and liner notes. Tier 2 subscribers will also receive access to a very special documentary series titled "Of Our Own Volition" filmed by award-winning director Marc Ricciardelli.